Lots of updates today since we’ve had a few days off at Miami’s news blog….so let’s get right to it. The Heat have rounded out their roster, more or less, with a few guys willing to take far less money in order to play with the “Three Kings,” being LeBron James, Dwayne Wade, and Chris Bosh. Juwan Howard and Mike Miller being the two biggest names of the group. The best beer in Miami is NOT from Miami. 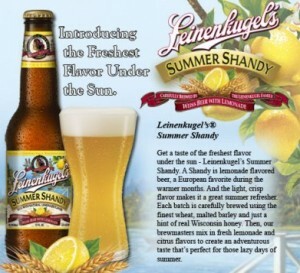 That’s right, the best Summer Beer of Minnesota, which is actually made in Wisconsin, is Summer Shandy by Leinenkugel’s. If you have not had this one, the only place it’s been found is the Weston Town Center Publix. (There were two 6 packs, now there are zero.) It’s a refreshing Summer brew that has a kick of lemon, and if you like that kind of stuff, it’s absolutely incredible. Recent celebrity sightings have ranged from Daunte Culpepper to Lawrence Taylor, who worked out at LA Fitness in Sunrise just this past week. The two football icons were both working out and spotted by our very own Terry Bender. The Marlins won the series versus the Colorado Rockies, and gained some ground to remain only 7 games back as August rolls around. Yes, that is a joke, but the Marlins do have a chance to win the division, if the Braves absolutely TANK. Look for our new restaurant review section and detailed posts, coming next week right here at Miami blog. We hope to be the largest conglomerate of Miami restaurant reviews, so stay tuned, keep your forks ready, and bookmark the page.